The tutorial explains the nuts and bolts of Excel MONTH and EOMONTH functions. You will find an array of formula examples demonstrating how to extract month from date in Excel, get the first and last day of the month, convert month name to number and more. In the previous article, we explored a variety of Excel functions to work with weekdays and days of year. Today, we are going to operate on a bigger time unit and learn the functions that Microsoft Excel provides for months. Microsoft Excel provides a special MONTH function to extract a month from date, which returns the month number ranging from 1 (January) to 12 (December). Where serial_number is any valid date of the month you are trying to find. 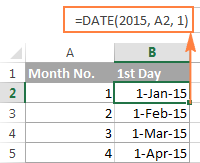 For the correct work of Excel MONTH formulas, a date should be entered by using the DATE(year, month, day) function. For example, the formula =MONTH(DATE(2015,3,1)) returns 3 since DATE represents the 1st day of March, 2015. Formulas like =MONTH("1-Mar-2015") also work fine, though problems may occur in more complex scenarios if dates are entered as text. =MONTH(A1) - returns the month of a date in cell A1. =MONTH(TODAY()) - returns the number of the current month. At first sight, the Excel MONTH function may look plain. But look through the below examples and you will be amazed to know how many useful things it can actually do. 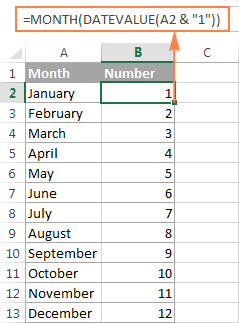 There are several ways to get month from date in Excel. Which one to choose depends on exactly what result you are trying to achieve. MONTH function in Excel - get month number from date. =MONTH(A2) - returns the month of a date in cell A2. =MONTH(DATE(2015,4,15)) - returns 4 corresponding to April. =MONTH("15-Apr-2015") - obviously, returns number 4 too. TEXT function in Excel - extract month as a text string. =TEXT(A2, "m") - returns a month number without a leading zero, as 1 - 12. =TEXT(A2,"mm") - returns a month number with a leading zero, as 01 - 12. Please be very careful when using TEXT formulas, because they always return month numbers as text strings. So, if you plan to perform some further calculations or use the returned numbers in other formulas, you'd better stick with the Excel MONTH function. The following screenshot demonstrates the results returned by all of the above formulas. Please notice the right alignment of numbers returned by the MONTH function (cells C2 and C3) as opposed to left-aligned text values returned by the TEXT functions (cells C4 and C5). =TEXT(A2, "mmm") - returns an abbreviated month name, as Jan - Dec.
=TEXT(A2,"mmmm") - returns a full month name, as January - December. If you don't actually want to convert date to month in your Excel worksheet, you are just wish to display a month name only instead of the full date, then you don't want any formulas. Select a cell(s) with dates, press Ctrl+1 to opent the Format Cells dialog. On the Number tab, select Custom and type either "mmm" or "mmmm" in the Type box to display abbreviated or full month names, respectively. In this case, your entries will remain fully functional Excel dates that you can use in calculations and other formulas. For more details about changing the date format, please see Creating a custom date format in Excel. To return an abbreviated month name (Jan - Dec). To return a full month name (January - December). There are two Excel functions that can help you convert month names to numbers - DATEVALUE and MONTH. Excel's DATEVALUE function converts a date stored as text to a serial number that Microsoft Excel recognizes as a date. And then, the MONTH function extracts a month number from that date. Where A2 in a cell containing the month name you want to turn into a number (&"1" is added for the DATEVALUE function to understand it's a date). Start_date - the starting date or a reference to a cell with the start date. Months - the number of months before or after the start date. Use a positive value for future dates and negative value for past dates. =EOMONTH(A2, 1) - returns the last day of the month, one month after the date in cell A2. =EOMONTH(A2, -1) - returns the last day of the month, one month before the date in cell A2. Instead of a cell reference, you can hardcode a date in your EOMONTH formula. For example, both of the below formulas return the last day in April. To return the last day of the current month, you use the TODAY() function in the first argument of your EOMONTH formula so that today's date is taken as the start date. And, you put 0 in the months argument because you don't want to change the month either way. Note. Since the Excel EOMONTH function returns the serial number representing the date, you have to apply the date format to a cell(s) with your formulas. Please see How to change date format in Excel for the detailed steps. As you already know, Microsoft Excel provides just one function to return the last day of the month (EOMONTH). When it comes to the first day of the month, there is more than one way to get it. For example, =DATE(2015, 4, 1) will return 1-Apr-15. =EOMONTH(TODAY(),0) +1 - returns the 1st day of the following month. As you remember, we already used a similar EOMONTH formula to get the last day of the current month. And now, you simply add 1 to that formula to get the first day of the next month. =EOMONTH(TODAY(),-2) +1 - returns the 1st day of the previous month. =EOMONTH(TODAY(),-1) +1 - returns the 1st day of the current month. You could also use the Excel DATE function to handle this task, though the formulas would be a bit longer. For example, guess what the following formula does? Yep, it returns the first day of the current month. In Microsoft Excel, there exist a variety of functions to work with dates and times. However, it lacks a function for calculating the number of days in a given month. So, we'll need to make up for that omission with our own formulas. In the above formula, the DATE function returns the first day of the following month, from which you subtract 1 to get the last day of the month you want. And then, the DAY function converts the date to a day number. For example, the following formula returns the number of days in April (the 4th month in the year). Where A2 is cell with a date. In a large table with lots of data, you may often need to get a sum of values for a given month. And this might be a problem if the data was not entered in chronological order. The easiest solution is to add a helper column with a simple Excel MONTH formula that will convert dates to month numbers. 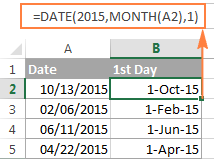 Say, if your dates are in column A, you use =MONTH(A2). Where E2 is the month number. Where column A contains dates, column B contains the values to sum and E2 is the month number. Note. Please keep in mind that both of the above solutions add up all values for a given month regardless of the year. So, if your Excel worksheet contains data for several years, all of it will be summed. Now that you know how to use the Excel MONTH and EOMONTH functions to perform various calculations in your worksheets, you may take a step further and improve the visual presentation. For this, we are going to use the capabilities of Excel conditional formatting for dates. In addition to the examples provided in the above mentioned article, now I will show you how you can quickly highlight all cells or entire rows related to a certain month. 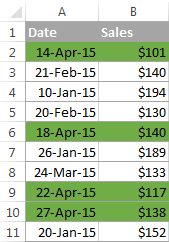 In the table from the previous example, suppose you want to highlight all rows with the current month dates. 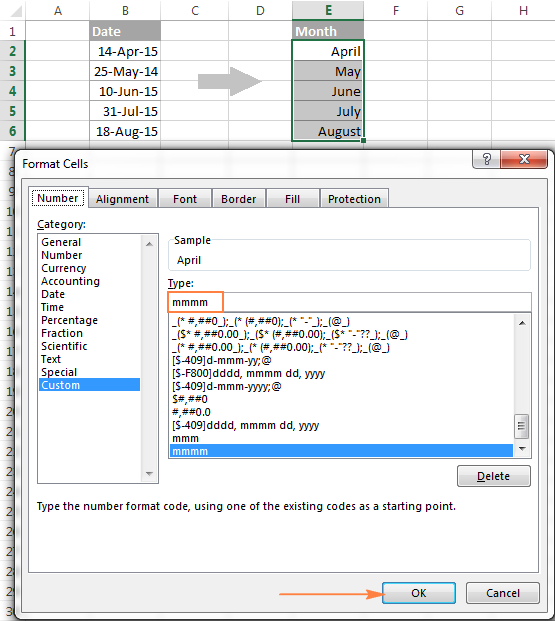 Create an Excel conditional formatting rule based on this formula, and your result may resemble the screenshot below (the article was written in April, so all April dates are highlighted). And here's another challenge. Suppose you want to highlight the major holidays in your worksheet regardless of the year. Let's say Christmas and New Year days. How would you approach this task? This is how the MONTH function in Excel works. It appears to be far more versatile than it looks, huh? In a couple of the next posts, we are going to calculate weeks and years and hopefully you will learn a few more useful tricks. If you are interested in smaller time units, please check out the previous parts of our Excel Dates series (you will find the links below). I thank you for reading and hope to see you next week! 120 Responses to "Using MONTH and EOMONTH functions in Excel - formula examples"
Hi, may I know how to convert the data below to month ? I hope u will get your answer .. If "01.09.2015" is a text value, then replace "." with "/" first to convert it to a date. You can use the Replace All feature as demonstrated in Converting text strings with custom delimiters. And then you can apply the mmm'yy format to the cell, see Creating custom date format for the detailed steps. Im trying to autofill dates from a month..
example: if i fill the name of month: january.. then my 31 tables has to autofill the dates. those tables has to be connected with the name january..
i made something for now..
For us to be able to help you better, please send us the formula you use. however also wanted to know if its possible to count how many dates occur in the next 60 days. Have a list of certificate expiry dates, and want to know how many in column E expire in the next 60 days. Is this possible within excel? and none work/give me the correct answer. trialing the equations and know I have 4 within the next 60 days, each either give me 6 or 0. Note, this is an array formula. Press CTRL+SHIFT+ENTER to enter it. For example : 01-03-2015 and 03-04-2015. I will get difference as 33 days. I need a formula which returns inception-to-date sum of a specified account code, such that this sum changes whenever a month is selected from a drop-down list. Need help! I am trying to convert a Month into the a date number. I have cheques eg.cheque issue date 29/03/2015 chque is valied for 6 months issue date to future six month how to calculate. Actual expire date of cheque I want. I used the formula "Datedif" both for Month and year, it's missed one Month or one Year. Eg. 01/Jan/2014 and 31/Dec/2014 the logical is 12 Months but the answer of the formula is 11 Months (Wrong). Please help - I want in my formula to include both the months at the time of calculation. credit date to payment date how to calculate day in the exel work sheet. I was wondering how to create a formula so that I can see data from a particular month. Is there a way to clean up How to sum data by month in Excel so I don't need a second 'month' column? And can this be modified to sort data by month and year, ie, multiple years data that is parsed into January , february, etc buckets by year, say a column for 2015 that shows Jan - Dec and another column for 2014 that does the same for Jan-Dec but extracts data from a multi-year column of data? Sorry, looks like it's not possible to accomplish this task without parsing data. how to get three letter month for example convert December into DEC. I have a date in a cell (6/12/14). I would like to be able to show just the year in another cell. If the date is before July 1 then the return would be 2014. If the date is after July 1 then the return would be 2015. When i subtract two dates like 1/Feb/2016-1/Jan/2016=31 days. i want to know that these 31 days come in which month (For Example= Jan'15 month). Please help to suggest any formula. I was wondering if it would be possible to use the "Month" formula to conditionally format dates which are either one month or two months old? So for example, if the current month is February, I would want dates that fall between December to January to be highlighted. But I want this to go on for a continual basis, so that when I put in some dates next month, January and February will be highlighted. Is this possible with conditional formatting? Many Thanks. I am trying to convert date to fiscal month however the CHOOSE function does not seem to calculate ? The formula is correct. Most likely the problem is with the original date in G4, which is either text or a date in the format that Excel does not understand. how many days in april did I work and for each month that year? I have a LOT of dates to go through so this would speed it up. I have a spread sheet filled with training dates for multiple people. I want to all cells with dates to be green if they have a date beyond 6 months from today; yellow fill if the dates are within 3 and 6 months from today; and red if they 3 months or less from today. I've tried a few conditional formatting options but I can't seem to get the correct formula needed. can you please tell me how to write 5 years 11 months to 5.11 or 5-11 or by using any separator?? I am very new to excel, and to using formulas, this is what I need, and I would think it's fairly simple for the trained. 3. I need to fill a table that calculates the number of months per FY for the project. FY16 - 6, FY17 - 12, FY18 - 12, FY19- 12 fY20 - 12, FY21 -6.
there are two sheets in excel one contains data and other sheet has function based on date. i want to get the date depends on date there are many duplicate dates in data sheet it should consider all the data which contains the date in a cell in sheet to date in a cell. when i change the date the reflecting also must change. how can i calculate a certain date in next month from any date of current date. How can i get a date (Suppose the date's 06.07.2016) in all cases using a uniform formula in excel. I have an issue with my excel sheet in displaying dates incorrectly. The problem is when i collect a data for whole month which has several dates in it, it automatically converts the dates while in filter starting from 1st to 12th dates as months and remaining dates normally. Can you please help me on how to change/modify it. These are considered as dates when using sort/filter. I have tried to clear the cache, delete files on Registry, re-installation of office and repair and still there is no change. This article is amazing and so is this website in general. LOADS of information published for everyone to read which is exactly the type of forum I'm looking for. I am trying to utilize this formula to show a date for today's year and month for that specific end number, in this instance 22, which by today's date it would state 7/22/2016. What I really need is it to state to next date that falls under these standards. For instance. I want it to now state 8/22/2016 because 7/22/2016 has already passed. I don't know how to alter the month part to show the next month if today's month doesn't apply anymore because the month's date has already passed. Let me know what you come up with. I'd love to hear some feedback. I'm stuck between a rock and a hard place right now. how can i get the formula for a birth date 10/29/2011 in months to show 55 months? you can't since its 57 months. I am doing a cashflow sheet. It is broken down into months. I have an estimate balance and then a real time balance that is updated daily. Is there a way to have a formula depending on the date will show estimate figure if it is still in that month, but once the month expires the real time balance figure is used? So two different sums for one cell depending on the date? I am looking to create a formula to pick up if something falls between two months but the year I am looking at is not specified. That's a very powerful explanation. Quick question on converting Month abbreviated name to Full name. I have downloaded bank statement that has date columns showing as "Jan 4, 2016". With Text to Column, I am able to separate Jan, 4 and 2016. Now if I would like to combine the fields into proper Date field, I can't do as the name of the month is Jan (in General format) and not January. so the Date formula is not working. Is there a way to get to January from Jan (in general format) and February to Feb? Unless there's another way that can help me save some time? Thanks you for your suggestions. This was a great read and helped me with some answers i needed :). I am trying to find a formula for my work project.. I want a highlighted cell in three years time(like a Gantt chart?). date of travel forms received 15 days before beginning date of in-state travel, and 45 days before out of state travel. I am preparing a church membership database in excel. All members are giving church support fund monthly based on their income.Many of them give their support fund 3 4 months advance. 250 01 09-2016 1000 January 2016 (In this column the month should automatically displayed according to the monthly fund entered for each member. Which formula I can use. I am trying to find a formula in excel that returns a value for the month number based on a financial year. I start with 30.0 days in Month#1 and want to subtract 2.5 days per following month. How can I get an automatic, based on the current month, "running" total of the days remaining month by month? I got answers after several INDEX & MATCH equations as YYYY-MM as to view. But cell is not formated as date. Now I need to substract several month from above type answer and get the final result as YYYY-MM type. I want to be able to populate a word document with data from an excel spread sheet, but, not all the data. Each month for our newsletter we publish birthdays for the month. Is there a way that I can write a VBA or a formula that will each month take data just for that month with regards to birthdays and anniversaries and populate our word document. Basically I want it to select data for example for November and publish only that data in the document rather than the entire excel spreadsheet that has data for a full year. I'm using =datedif(A1,B1,"d") formula to calculate the days of the month but when I put the start day 10/1 and the end 10/31 counts 30 days and I don't know how to make to count 31 days that is what I need. I'm working in a foster care agency and to pay the providers I need to calculate exactly the days that every month has. Please if there is another formula could you share with me. Use formula =datedif(A1,B1,"d"+1 to get the desired output. Hi, I'm wanting to find a formula which will highlight dates that are not in the current month. Thanks in advance. I want to know difference in month (not full month)between two date inclusive of both date. i have date of joining (21-09-2011), suppose 24 months contract, what will be my next vacation date, need formula in excel. Sale data is 1 to 31 days already have in row and then 120 shops in column.I want known What shop sale data no have 4 days series. Hello, I used the formula you shared "=DATE(2017,MATCH($A$1,$N$1:$N$12,0)+COLUMNS($A$2:A2),1)" which worked great to fill in the series of months. Now I can get my sheet to automatically fill in the series if I select March or July. Is there a way to have it fill in only the number of months I need? For example. If I select January as my starting month and only need it to fill the series through July (6 months). Or 9 months, etc. How can that be done? I have a cell with date. I want to change the format of that cell after the last date of that month. Suppose the cell has value 3/22/2017. The cell formatting should change once the date reaches 4/1/2017. How can I do that? 2. 15th march, 2015 in same month and just i want to know after completion of 1 year will be 1st march, 2016 and 15th march was moved to 1st April. can you please suggest me what is the exact formula for that. I have last 7 months production data of different products.some of products have no outcomes for 2 or 3 months continuously. How can I identify the particular product from lakhs of products. Is there any formula available for it? I have a date of say 20170501 in cell A1, and need B1 to show the end of the month of whatever month is in A1. So in this instance it would need to show 20170530.....if A1 was 20170330 it would need to show 20170331....and so on. Is this possible? Don't forget to change the format of B1 to Date. You can learn more about this function here. TB PESENT KO 1 MONTH ME RS.500 DENA HAI AND HIV PESENT TO 1 MONTHME 1000 DENA HAI SARE PESENT EK HI SHEET MA HAI AUR KESEKO 6 MONTH KA PEISE DENE HAI OR KESEKO 8 MONTH KE PAISE DENE HAI TO EXCEL KAISE FORMULA DENI CHAHIYE. Starting Date Given suppose e.g 5 Feb 2014 Contract Period is 3 year.How to find the Contract Completion Date ? I do have a column X "Due Month" and another "Task completed" .I want to do a vlookup whereby if the referenced cell in task completed column is "yes" then then vlookup should increment the month +1. Is that possible? Then just copy the data from the helper column and use the Paste Special -> Values option to replace the values in Column X. Is there a way to keep I4 with the year (i.e. 5/1/18), but use the Z* dates without a year? I am from nepal. In nepali date month of February consists above 28 days so if i want to write the date above 28 its date format will be yyyy-mm-dd instead of mm/dd/yyyy . how to make this format as mm/dd/yyyy. I'd like to calculate how many holiday days are subtracted from weekdays every month, where I have a table with the LEGAL HOLIDAYS with column A as description of holiday and column B as date of holiday. in the next table I have the calendar month start date in column A, month end date in column b, workdays.intl in column c to calculate workdays with special weekends. In column d I need the formula to calculate the number of holidays to deduct in each of the calendar months based on the legal holidays table. can you please help? =TEXT(A1,"mmmm") returns the correct answer (the Month of the year) unless the cell in Column A is blank, then it returns December. What do I need to add to the formula so if the cell is blank the formula returns as blank? Project start date 11-May-2018. Project completion is 15 months from start date. How to calculate in DD-MMM-YYYY format. You can use EDATE to calculate dates that fall on the same day of the month as the date you are interested in. For example, in your case where 11-May-2018 is in A1 it would look like this: =EDATE(A1,15) returns 11-Aug-2019. EDATE is useful for loans or payments of various types that mature or are due on a specific date. =DATE(YEAR(A1),MONTH(A1)+15,DAY(A1)) and then add a date in the past or future as this formula shows with +15 in the month spot. Past dates would require a - sign. Remember to format the cells in the date format you are comfortable with. They have to be a date, not text. Excel has a built-in date that formats the cell to display dates in the way you want. Right click on the cell, choose Format Cells then select the Date option form the list and you'll see all the various ways Excel can display your date. If that doesn't work go to the Custom option in the Format Cells list and you'll see more options to display numbers, dates and times. I need to have one cell show "firsthalf" or "secondhalf" month depending on the date values on other two cells; EG first cell shows date 07/01/18, second cell shows 07/15/18 I want a 3rd cell to return "firsthalf" text. How to convert e.g; Jul-04-2018 to 04-07-18. Thank you. Try to right click on the cell containing the date and select Format Cells then from the list click Date then select the date format you want to use. i have a question. I have set of dates in a year (cell D1 to D20). I need to count how many days in specific month. Right now, I have use formula COUNT(IF(MONTH(D15:D17)=1,1)), to count how many dates occur in January and i use CTRL+SHIFT+ENTER. My problem is, this formula works for february to december, but not for january. If i key in this formula, it will count all the cells eventho its empty unless i key in dates not in january. For example, D1 to D20 is about 20 cells, if i key in this formula, it will give me 20. If all the 15 of the cells dated january, and another 5 cells is empty, it will count as 20. And if the 15 cells dated january, and another 5 cells is dated february or other months, it will count as 15. Then I label an adjacent cell with the appropriate date. So, If my original date cell shows 9/16/2018; then my resultant date cell would have no entry. However, IF my original date cell was 10/16/2018; the resultant cell would return 10/31/2018 (a valid date). Just want to say thanks for this great help. Thanks for the great info. 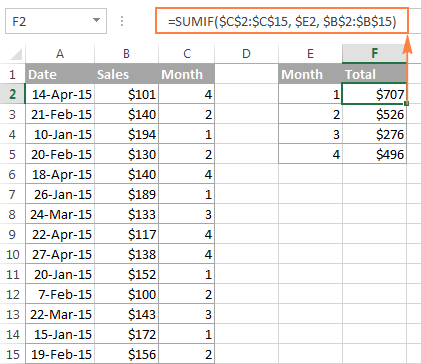 In the section How to sum data by month in Excel, your example with the sumproduct formula returns a #value error for me when I use your data. Is there a mistake in that formula? I have just retested the SUMPRODUCT formula, and it works fine for me. It's difficult to say what the problem may be without seeing the actual worksheet. Try to use it on a new sample sheet with just a few data entries. Does it also return an error? Thanks so much for your reply. I'm so sorry - I had a typo on one of the dates. It works now. But, what I am trying to do on my spreadsheet is to get a similar calculation where the dates are simply 'January, February...' That gives me the #value error again. Would you have a solution for that, please? If the names of the months are entered as text, then you can convert them to numbers by using this formula. And then, use a simple SUMIF formula to add up the amounts for the desired month. Where A2:A15 are the month names, C2:C15 are the numbers to sum and E2 is the number of the target month. The little '1&' before the range in the MONTH function nearly killed me! I really appreciate your help with this and find great value in your articles. Can you help me in below query. I have 2 date like 15 Aug 17 to 20th September 18. From this two details ,I have to extract the month and days in each months. What the VBA code to display the previous month and current year? I'm using the below code to display the current month and year. Is it somehow possible to convert dates in the format like this: Thursday 31 January to 31-01-2019? Hi I would like to check if its possible for the extracted month to be automatically updated? I have a column for month with the formula: TEXT(C17,"mmm") for example. If i happen to change the date in cell C17, the month cell does not automatically update to the new month input. I'm wanting to get a text month name for a certain date range each month from a date cell. If the date is between the 27th of one month to the 26th of the next month I want it to state only a month name. Example: If the date is between 12/27/2018 to 01/26/2019, I want the cell to say "JAN". If the date is between 01/27/2019 to 02/26/2019, I want the cell to say "FEB". Is there a formula for this? Hi, I wanted to multiply $9 per month including any partial month. Looking for a simple formula. 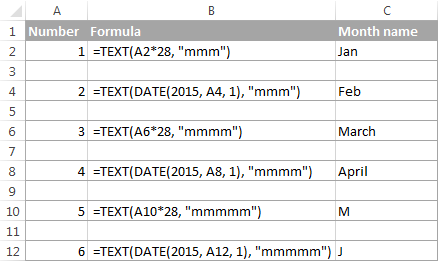 While =Text(A2,"mmmm") function gets you the month of the date, it is displaying 'January' for blank cells. How can be avoid this such that the cell remains blank and should not display 'January'. is a good formula for determining on what date an event that straddles multiple months falls. For example I am doing a monthly analysis but some events straddle multiple months (most only straddle two when they do so this works). I take the median which tells me on what date an event straddling two months falls. Then I format the column with the customized mmm-yyyy style. This is a good method for determining the midpoint of an event that falls mainly in one or two months.